DDU-GKY is uniquely focused on rural youth between the ages of 15 and 35 years from poor families. As a part of the Skill India campaign, it plays an instrumental role in supporting the social and economic programs of the government like the Make In India, Digital India, Smart Cities and Start-Up India, Stand-Up India campaigns. Over 180 million or 69% of the country’s youth population between the ages of 18 and 34 years, live in its rural areas. Of these, the bottom of the pyramid(BoP) youth from poor families with no or marginal employment number about 55 million. 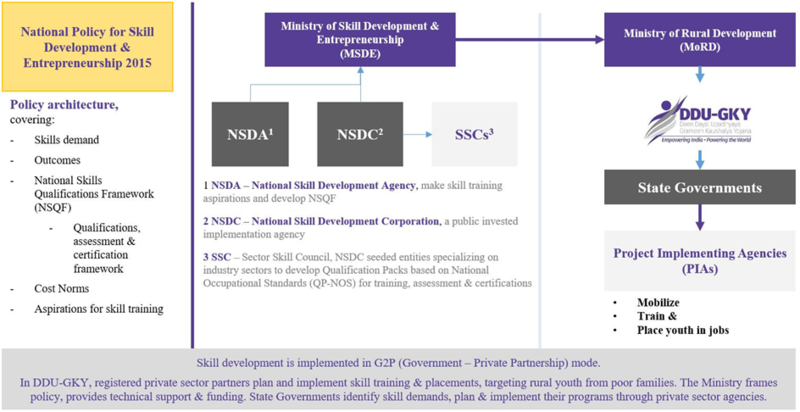 The National Policy for Skill Development & Entrepreneurship 2015has identified a skills gap of 109.73 million in 24 key sectors by the year 2022. This number cannot be achieved without addressing the BoP 55 million from rural India. Also, a FICCI and Ernst – Young study published in 2013 identified a shortage of over 47 million skilled workers across the globe by 2020. This presents an unprecedented opportunity for India to train its BoP youth population and place them in jobs across the world and realize its demographic dividend. DDU-GKY is mindful that it must engage the support of multiple partners to ensure success and maximize on the investment made in time and resources. In order to energize and build mass support as well as create awareness amongst the rural youth. The DDU-GKY projects are market linked and implemented in Public Private Partnership (PPP) mode. The involvement and partnership between civil society organizations, Educational institutions, apex skill partners and regulating organizations, the Government and Private organizations, ensures that DDU-GKY can leverage on the strengths of all and achieve transformative change. Curriculum framing and assessment support is through NCVT (National Council on Vocational Training) or SSCs (Sector Skills Councils). Industry partnerships allow access to new technology and on the job training. There are dedicated training hours for soft skills, spoken English and basic computers, in residential as well as non-residential well equipped campuses, with adequate technology as per industry standards. Our team makes unrelenting efforts to make sure that we can achieve a minimum placement of 70% of the project target of all trainees, through the support of our training partners and employer engagement with a minimum recommended monthly salary of INR 6,000/- (varying based on training acquired). Industry interactions have emphasised the need for training in soft skills, team working etc., as more important than domain skills, which they learn on the job. To ensure that candidates can perform in their work areas as well as assimilate into the organization and society, DDU-GKY has mandated a minimum of 160 hours of training in soft skills, functional English and computer literacy. Additionally, a finishing module called "Work Readiness training" is suggested to ensure that trained candidates hit the ground running wherever they join. A retention strategy is just as important to us and we have put in place mechanisms to track performance post placement, salary top-ups to candidates through Direct Bank Transfer (DBT), incentives to training partners for achievement of outcomes in retention & career progression and a framework for the establishment and operations of a migration support centre. Benefits to candidates are in the form of free training, free uniform, free course material, free lodging and board in case of residential programs, reimbursements of expenses in non-residential programs, post placement salary top-ups every month for 2-6 months depending on location of placement and placement for at least 70% of all trained with a minimum salary of Rs. 6,000/- per month (as cost to company). Introducing predictability in government process by defining minimum service level benchmarks and standards, controls & audits, defaults and remedial actions to reduce Inspector Raj in an all pervasive quality assurance framework comprising of the Guidelines & Standard Operating Procedures (SOPs). The high point of the framework is inclusion and self-regulation, with assigned role and responsibilities for Q-Teams within the PIAs. Additionally, transparency and accountability is fostered through the end-to-end implementation of Public Financial Management System (PFMS) as the channel for fund disbursals and audits. This allows DDU-GKY to invest in capacity building of the private sector, front-loading 25% of the training costs so that PIAs are not constrained to invest in quality training centres. A Geo-Tagged Time Stamped Biometric Attendance Record: similar to what the candidates will eventually find in most organizations. This serves a dual purpose of being a monitoring tool, and also it also making candidates familiar with modern technology. Provision of a Tablet PC per candidate at the training centre. This enables candidates to learn at their own pace. Presence of Computer Labs and e-Learning at Training Centres, to ensure that all candidates have access to a wider curricula and adequate learning opportunities. In addition, DDU-GKY as part of its management process and MIS requirements ensures that all Training partners invest in IT infrastructure and is working on a nation-wide network for sharing real-time performance data, meaningful graduate and financial information and creating a strong independent Placement Initiative.